The 2017 Aboriginal Peoples Survey marks the fifth cycle of this voluntary national survey of Inuit, Métis and First Nations people living off reserve, aged 15 years or older. In 2017, the survey focused on participation in the economy. The APS provides data on a wide-range of topics including labour, education, language, housing and health to inform policy and programming activities aimed at improving the well-being of First Nations people living off reserve, Métis, and Inuit. It is a valuable source of information for organizations, communities, service providers, researchers, governments, and the general public. The following are findings for people who self-identified as Inuit. Also available are Labour Market Experiences of First Nations Peoples Living off Reserve: Key results from the 2017 Aboriginal Peoples Survey (Catalogue no. 89-653-x2018003) and Labour Market Experiences of Métis: Key results from the 2017 Aboriginal Peoples Survey (Catalogue no. 89-653-x2018002). Meaningful engagement and relationship building are highly valued at Statistics Canada. We are working to strengthen lines of communication with First Nations, Métis and Inuit communities through our Aboriginal Liaison Advisors (ALAs). 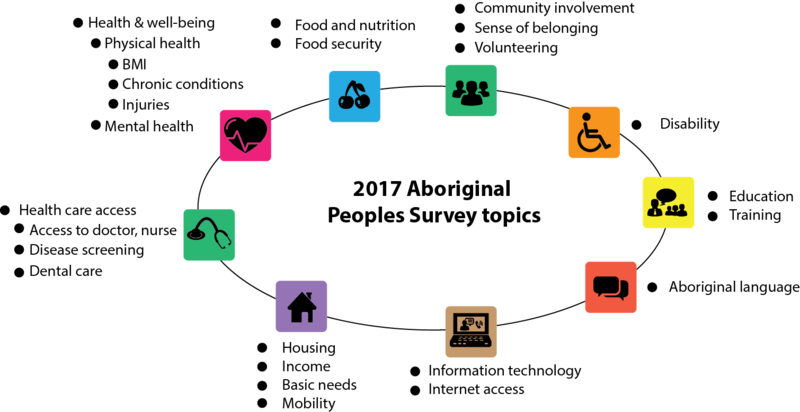 This network of eleven advisors across the country works with communities and organizations to increase the understanding of, and access to, Statistic Canada products and services, as well as promote the use of these data sources for decision-making and community-planning activities. A number of Indigenous organizations and people have played a key role in either the development or testing of the survey over the five cycles of the APS. New content for the 2017 APS questionnaire was extensively tested with First Nations, Métis and Inuit respondents before it was finalized. Indigenous people were hired as interviewers and guides during data collection. As well, various National Indigenous Organizations worked with Statistics Canada to promote participation in the APS, and to review analytical findings. Statistics Canada is supporting Indigenous Statistical Capacity Initiative, grounded in the needs of First Nations people, Métis and Inuit and aimed at providing expanded services and working together to build statistical capacity through training, engagement, and outreach. According to the census, the Inuit population increased 29.1% from 2006 to 2016. Close to three-quarters (72.8%) of Inuit lived in Inuit Nunangat, the homeland of Inuit in Canada: 46.3% in Nunavut, 18.1% in Nunavik, 4.8% in the Inuvialuit regionNote 1, and 3.5% in Nunatsiavut. The average age of Inuit in 2016 was 27.7 years, significantly younger than the non-Aboriginal population average of 40.9 years. Close to three-quarters (72.8%) of Inuit lived in Inuit Nunangat, the homeland of Inuit in Canada: 46.3% in Nunavut, 18.1% in Nunavik, 4.8% in the Inuvialuit Region , and 3.5% in Nunatsiavut. In this report, ‘large Inuit communities’ are defined as communities with 1,000 or more people and a population density of 400 people per square kilometre. Of the 53 communities within Inuit Nunangat, the large Inuit communities are Iqaluit, Pangnirtung, Cambridge Bay, Kugluktuk, Rankin Inlet, Arviat and Baker Lake in Nunavut; Inukjuak, Kuujjuaq, Puvirnituq, and Salluit, in Nunavik; and Inuvik, in the Inuvialuit region. Communities with less than 1,000 people or a municipal density of less than 400 people per square kilometer are referred to as ‘small Inuit communities’. The ‘younger/young adult’ age group is defined as those aged 15-24. The ‘core working age’ is defined as age 25 to 54, as individuals in this age group are more likely to have completed school and be available for full-time work than those aged 15 to 24, and less likely to have entered retirement than those 55 or older. The ‘older’ age group is defined as individuals aged 55 or older. Almost one half (49% or 21,315 individuals) of Inuit aged 15 or over were employed in 2016. Inuit of core working age had a higher employment rate (58%) than those in the younger (36%) or older (39%) age groups. The share of core working age Inuit who were employed was higher outside Inuit Nunangat (64%) than within Inuit Nunangat (56%). There were differences across the regions within Inuit Nunangat. The share of core working age Inuit who were employed ranged from 49% in Nunatsiavut and 53% in Nunavut, to 61% in the Inuvialuit region and 64% in Nunavik. In 2017, 79% of employed Inuit worked a permanent job. Of the 21% that worked a non-permanent job; 4%E worked a seasonal job, 7% worked a temporary, term, or contract job, 9% worked a casual job, and the remainder worked a job that was not permanent in some other way. Outside Inuit Nunangat, one in six (16%) Inuit aged 25-54 had moved for job-related reasons compared to 5% within Inuit Nunangat. The percentage of core working age Inuit who moved for job related reasons ranged from 4% of Inuit in Nunavik to 9% of Inuit in the Inuvialuit region. Women were more likely to work part-time than men (25% versus 17%). Younger Inuit were more likely to work part-time (40%) than older Inuit (24%), who in turn were more likely than core working age Inuit (15%). This table displays the results of Data table for Chart 1. The information is grouped by Reason for working part-time (appearing as row headers), Percent (appearing as column headers). The majority (56%) of core working age Inuit who worked part-time and half (50%) of older Inuit who worked part-time, did so involuntarily. Going to school was the leading reason reported by Inuit aged 15-24 for working part-time (51%). Other prominent reasons reported for self-employment included being able to set flexible hours (11%E), and the nature of the work requiring self-employment (9%E). 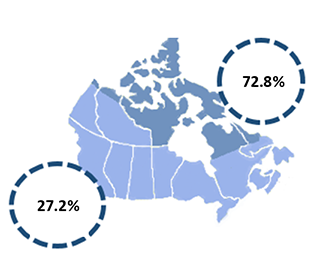 While 28%E of self-employed Inuit did receive outside assistance for their business, this share was larger among Inuit within Inuit Nunangat (42%E) than those outside of Inuit Nunangat (19%E). Over three in four (78%) Inuit aged 15 or older participated in other labour activities during the past year. A larger share of Inuit in Inuit Nunangat compared with those outside Inuit Nunangat had participated in these activities (84% versus 62%). About one in six (16%) Inuit aged 15 or older did these activities for money or to supplement their income in 2017, which again was more common in Inuit Nunangat than outside Inuit Nunangat (20% versus 7%). Among the Inuit regions this was most common in Nunavik (27%), followed by Nunavut (19%) then the Inuvialuit region (14%) and Nunatsiavut (14%). Those not in the labour force and unemployed were more likely to have participated in labour activities for income (20% and 18% respectively) than those who were employed (13%). Over half (56%) of Inuit said that they hunted, fished or trapped in the past year. This was more common within Inuit Nunangat (65%) than outside Inuit Nunangat (37%). Inuit men were more likely to hunt, fish or trap than women (66% versus 47%). About 6% of Inuit did this for income or to supplement income. This figure was 10% in Nunavik, 8% in Nunavut, 5% in the Inuvialuit region, 2% in Nunatsiavut. Forty-two percent (42%) gathered wild plants in the past year. This was more common among Inuit in Inuit Nunangat, than outside Inuit Nunangat (47% versus 30%). Roughly 2% of Inuit gathered wild plants for income or to supplement income; this was most common in Nunavik (5%). About one in four (27%) Inuit made clothing or footwear in the past year. This was more common among Inuit in Inuit Nunangat (34%) than outside Inuit Nunangat (12%). Almost half of Inuit women (47%) made clothing or footwear compared to 4% of men. About 6% did so for income or to supplement income. This was more common within Inuit Nunangat, than outside Inuit Nunangat (8% versus 2%E). About one in five (18%) Inuit made carvings, drawings, jewellery or other kinds of artwork in the past year. Participation in this activity was more common outside Inuit Nunangat (22%) than within Inuit Nunangat (17%). About (6%) did so for income or to supplement income. This was more common within Inuit Nunangat, than outside Inuit Nunangat (7% versus 4%E). One in four (25%) Inuit over the age of 15 volunteered for a group or organization at least once per month. In addition, over two in three (68%) reported helping people out on their own, not on behalf of an organization. For example, caring for someone’s home, driving someone to an appointment, visiting the elderly, shovelling snow or unpaid babysitting. The unemployment rate was higher among Inuit men than women (26% versus 18%). Unemployment rates were higher among younger Inuit (29%) than Inuit of core working age (22%) or older Inuit (15%). Unemployment rates were higher within Inuit Nunangat than outside Inuit Nunangat (25% versus 16%). Within Inuit Nunangat unemployment rates were 32% in Nunatsiavut, 28% in Nunavut, 21% in Inuvialuit region, and 18% in Nunavik. Unemployment rates varied with level of education, and were lower among Inuit with a university degree (7%) than among those with a high school diploma (18%) or those with less than a high school diploma (31%). Inuit have made gains in high school and postsecondary completion. In 2016, 29% of Inuit aged 15 and over had completed a postsecondary certificate diploma or degree, up from 26% in 2006. The percentage with less than a high school diploma dropped from 61% in 2006 to 52% in 2016. This table displays the results of Data table for Chart 2. The information is grouped by Barriers to employment (appearing as row headers), Men (reference category) and Women, calculated using percent units of measure (appearing as column headers). Within Inuit Nunangat, a smaller share of unemployed Inuit in Nunavut reported a shortage of jobs (83%) than in Nunatsiavut (96%) and the Inuvialuit Region (93%). Younger Inuit were more likely than core working age Inuit to report not knowing where to look for work (39% versus 26%) and not knowing what job to look for (38% versus 19%E). Most unemployed Inuit in both Nunavut (60%) and the Inuvialuit Region (56%) reported not having enough education or training for available jobs, compared to 35% in Nunatsiavut, and 40% in Nunavik. About six in ten (61%) Inuit outside Inuit Nunangat reported not having the required work experience for available jobs compared to 28%E in Nunavik, 30% in Nunatsiavut, and 41% in the Inuvialuit Region. This table displays the results of Data table for Chart 3. The information is grouped by What would help most to find work (appearing as row headers), Percent (appearing as column headers). A quarter (25%E) of Inuit outside of Inuit Nunangat and 45% in Inuit Nunangat said more jobs would help them most in finding work. The percentage of Inuit who reported this was lower in Nunavut (39%), than in Nunatsiavut (78%) and the Inuvialuit region (55%). Further, just over half (53%) of Inuit living in small Inuit communities said ‘more jobs’ would help them most, compared to a third (33%) of Inuit living in large Inuit communities. Close to a quarter (23%) of Inuit men said skills training would help them most to find work compared to 13%E of Inuit women. While 6%E of Inuit overall said child care assistance would help them most to find work, 11%E of Inuit women said child care assistance would help them most. About 44% of unemployed Inuit used two or more methods to look for work, although this ranged regionally from 32% of those in Nunavut to 65% of unemployed in Nunatsiavut. This table displays the results of Data table for Chart 4. The information is grouped by Method of looking for work (appearing as row headers), Percent (appearing as column headers). Use of community bulletin boards or radio was more common in Nunatsiavut (52%) and Nunavik (33%), and less common in Nunavut (20%E) and the Inuvialuit region (23%E). Inuit living outside of Inuit Nunangat (68%) were more than twice as likely to use the internet to look for work as their counterparts in the Inuvialuit region (30%), Nunatsiavut (17%E), and Nunavut (19%E). A smaller percentage of Inuit in Inuit Nunangat (68%) than outside Inuit Nunangat (91%) had internet access at home. A larger percentage of Inuit women reported using a mobile device to access the internet in the past month than Inuit men (76% versus 70%). Further, Inuit outside Inuit Nunangat were more likely to report accessing the internet through a mobile device than inside Inuit Nunangat (80% versus 70%). This table displays the results of Access to internet at home and use of internet on wireless devices among Inuit in 2017 by Inuit Nunangat region. The information is grouped by Inuit Nunangat region (appearing as row headers), Had access to the internet at home and Accessed internet on wireless device in the past month, calculated using percent units of measure (appearing as column headers). Individuals can be out of the labour force for a number of reasons including: being retired, caring for children/other family members, going to school, having a chronic illness or disability, or being a discouraged searcher (those who want employment and are available to work but are not seeking work because they believe they cannot find suitable work). Non-participation in the labour force was most common among older adults (54%) followed by young Inuit (49%) and then core working age adults (26%). Regionally, non-participation in the labour force was similar in Inuit Nunangat and outside Inuit Nunangat (37% versus 38%). Within Inuit Nunangat proportions ranged from 45% in Nunatsiavut, 38% in Nunavut, 37% in the Inuvialuit region and 32% in Nunavik. About 25% young Inuit, 32% of core working age Inuit, and 7% of older Inuit wanted to work in the previous week. This table displays the results of Data table for Chart 5. The information is grouped by Reason for not looking for work (appearing as row headers), Percent (appearing as column headers). Discouraged searchers accounted for a larger share of Inuit men who wanted to work but were not in the labour force than Inuit women (32% versus 15%E). Among Inuit women who said they would like to work but did not look for work, 22%E did so because they needed to care for their children. A larger share of core working age women (29%E) reported this than young Inuit women (17%E). A large share of young Inuit were not in the labour force because they were in school (20%E). This was less common for those in Inuit Nunangat than outside (11%E versus 43%E). Inuit in small communities were more than twice as likely as those in large communities to be discouraged searchers (35% versus 16%E). Disability screening questions have been added to the 2017 APS, allowing for a deeper understanding of how disabilities impact the lives of Inuit. Almost two thirds (61%) of young Inuit, 53% of core working age Inuit, and 12% of older Inuit said they would look for work in the next 12 months. This table displays the results of Data table for Chart 6. The information is grouped by What would help find work (appearing as row headers), Percent (appearing as column headers). About half (51%) of Inuit in Inuit Nunangat stated that more jobs would help them gain employment compared to under a quarter (22%E) of those outside Inuit Nunangat. Within Inuit Nunangat, those in Nunavik were less likely to say more jobs would help most (40%) compared to Nunatsiavut (69%) or the Inuvialuit region (61%). Around four in ten (39%) Inuit in Inuit Nunangat said skills training would help them find work compared to 22%E of those outside Inuit Nunangat. About one in five (19%) Inuit women said child care assistance would help them find work. Inuit in Inuvialuit region were most likely to say work experience would help (35%) compared to all other regions within Inuit Nunangat or outside Inuit Nunangat (ranging from 14%E to 19%). Inuit men were more likely than women to say that their writing skills limited their job opportunities (37% versus 27%). The same can be said for reading skills, with men more likely to report this than women (34% versus 27%). Inuit in Nunavik were more likely to say that their writing skills limited their job prospects (42%) than those in any other regions in Inuit Nunangat (33%-34%). Inuit outside Inuit Nunangat were least likely to find that their writing skills were limiting their job prospects (23%). Percentages were similar for reading skills. This table displays the results of Data table for Chart 7. The information is grouped by Labour Force Status and skill type (appearing as row headers), Percent very limiting and Percent somewhat limiting, calculated using percent units of measure (appearing as column headers). For those Inuit who took a course or participated in training, most (78%) took job specific training (e.g., professional training, equipment, occupational health and safety). Most Inuit who wanted to take training, wanted job-specific-training (57%). The most common reasons that prevented them from taking training were that training was not available (40%), personal or family responsibilities (39%), and being too busy to take training (36%). This is a sample survey with a cross-sectional design. The APS sample was selected from Census of Population long-form respondents who reported an Aboriginal identity or ancestry. Data collection took place from January 16, 2017 to August 15, 2017. The APS response rate was 76%, yielding a sample of approximately 24,000 Aboriginal respondents. For Inuit regions, the questionnaire was translated into Inuktitut and Inuinnaqtun. These versions were available as HTML files in the CAPI and CATI applications to assist interviewers with potential language barriers in the field. The 2017 Aboriginal Peoples Survey–Nunavut Inuit Supplement (APS–NIS) was designed to learn more about the availability, interest and level of preparedness for government employment of Inuit enrolled under the Nunavut Agreement (also known as Nunavut Inuit). Its target population was Nunavut Inuit aged 15 years or older living in private dwellings and comprised a large supplementary sample as well as an additional set of questions. The APS-NIS was released as a separate analytical file from the APS due to its different target population, objectives, sampling design and weighting strategies.